A man in a car who was trapped at an intersection by menacing SEIU protesters was arrested for assault with a deadly weapon after he slowly drove through the mob in an effort to escape. No one was reported injured in the Thursday incident, however an organizer claimed some had ‘bumps and scrapes’. The protest was in favor of extension of Temporary Protected Status for immigrants from Central American countries. The protest took place outside the office of Rep. Ed Royce (R-CA) in Brea, California where bused in protesters gathered to deliver letters in favor of illegal immigrants. The protesters reportedly blocked the intersection after their effort to meet with Royce’s staff were unsuccessful. Video posted by UNITE HERE Local 11 shows a mob of menacing protesters surrounding cars at an intersection amid the sound of horns blaring. One car advances very slowly as protesters part except for one man who appears to be a marshal for the protest who stands in front of the car and then leans on the hood, refusing to get out of the way, as the car creeps forward. A heavy-set marshal is then seen taking a running leap onto the hood as other protesters beat on the car with sticks. The car accelerates a little to get away but pulls to a quick stop when ordered to by police in the intersection. Police are seen surrounding the car to protect the driver from the mob. Some of the SEIU organizers can be heard yelling instructions in Spanish for protesters to back off. The Los Angeles Times reported on the arrest. KNBC-TV reported more on the protest. 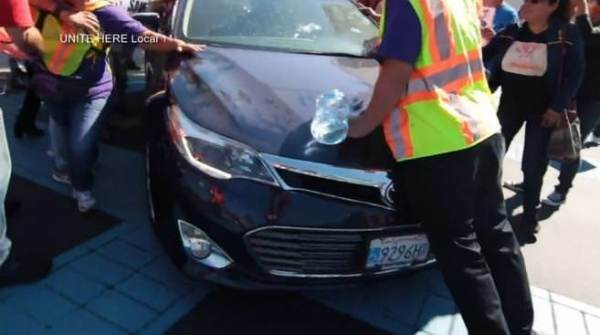 Daniel Wenzek was accused of driving a 2013 Toyota Avalon through a line of about 200 protesters at Birch and Brea boulevards about 1 p.m., Brea police Lt. Darrin Devereux said. Wenzek was driving west on Birch at Brea when he leaned on his horn and attempted to drive through the crowd of activists at a slow speed, according to police and video of the incident provided by protesters. Some of the protesters jumped on the hood of the car and banged on the vehicle before police intervened, circled the car and made Wenzek stop and exit the Toyota. The difference between this and Charlottesville is in that incident the driver of the car accelerated at a deadly, high rate of speed in to a crowd of protesters in the street. In the Brea incident, the driver crept through the intersection in an effort to free himself from a menacing mob surrounding him. Brea Police Chief Jack Conklin said none of the demonstrators sought first aid but the SEIU United Service Workers West union later released a statement saying six people were taken to a hospital for evaluation.